Mrs. Bromlow’s professional memberships include: American Academy of Estate Planning Attorneys (AAEPA), National Academy of Elder Law Attorneys (NAELA), the California Advocates for Nursing Home Reform (CANHR) Estate Planning and Trust Council of Long Beach and ElderCounsel™. 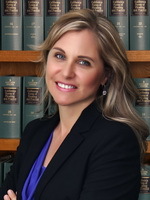 Laura currently serves on the board of governors of the Long Beach Bar Association. Mrs. Bromlow received her juris doctorate degree from Washburn University School of Law in 1997 where she graduated with a Certificate in Family Law. During law school Mrs. Bromlow was a student editor of the Washburn Law Journal, a member of the Phi Alpha Delta legal fraternity, a CASA (Court Appointed Special Advocate) volunteer, a clerk with the Kansas National Education Association and participated in the Law School Clinic. Mrs. Bromlow has consistently used her law degree to serve families over the years. Schomer Law Group is a firm focusing on estate planning, probate, trust administration and elder law issues. Based in Los Angeles, CA, with a satellite office in Orange County. Our mission is to provide residents of Los Angeles and Orange County and surrounding areas with quality estate planning resources, such as assistance with Living Trusts, Wills (simple & complex), Probate, Trust Administration, Powers of Attorney, Living Wills, Irrevocable Trusts, Family Limited Partnerships, and Charitable Giving. When you visit or call our office, we want you to feel comfortable discussing such an important issue concerning both you and your family. We want to arm you with the information you need to make an informed decision about your family's future. Visit our online Estate Planning Information Center to obtain timely, quality information on estate planning and related issues, including complimentary issues of our Special Reports and Estate Planning News articles. Residents of Los Angeles, Orange County and surrounding areas can register to attend our Estate Planning Seminars.